Summary: The 1byone O00QH-0514 wireless driveway alarm is cheaply made and has a low quality sensor that gets triggered randomly, by blowing wind or falling leaves. The Guardline GL2000 or the Dakota 2500 are much better alternatives. This specific 1byone model (O00QH-0514) is used to detect vehicles and people. So you can use it to receive an alert whenever there’s movement on your driveway. You can also add multiple motion detector sensors to the one receiver, which make is easy to secure multiple areas of your house. The package includes 1 receiver, 1 motion detector sensor that uses Passive Infrared (PIR) technology, mounting hardware and instruction manual. Purchase separately: batteries, power adapter for receiver. Whenever there is movement, the motion detector sensor (PIR sensor) will send a signal to the receiver (for up to 328 feet away). 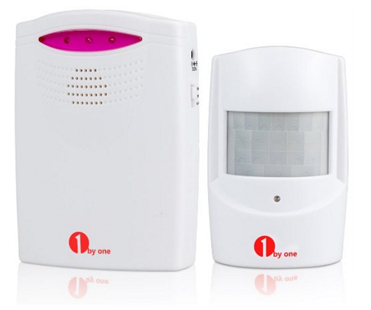 You can choose to be alerted by a low chime, alarm tone or simply by a flashing LED light. In order to prevent false alarms, install the motion detector sensor in a shady protected area, away from the sun and the wind. Also, do not install the sensor on a metal surface, since this will decrease the transmission range. I do not recommend the 1byone O00QH-0514. It’s made with cheap components that do not last a long time. Also, false alarms are a big issue with this specific model. The motion detector sensor is low quality and gets activated by blowing wind and falling leafs. Or in some cases it goes off randomly. I recommend the Guardline GL2000 if you’re looking for an alarm that detects people and cars. If you only need to be notified whenever a car pulls into your driveway, you can’t go wrong with the Dakota 2500, which is one of the best on the market.